The Signing Room: Online Sign Language "Class"
Do you want to improve your sign language skills? Do you have basic sign language skills but are looking to advance to the next level? Check out a unique ONLINE class! The Gallaudet University Regional Center for the Midwest is offering scholarships for 10 families of deaf and hard of hearing children who qualify. This is an intermediate level sign language "class" - but not a class in the normal context! This opportunity is all about bringing your conversational and academic sign communication to the next level. It is formatted in a very natural way by giving you conversational opportunities with others advancing their sign language skills, as well as Deaf adults in a small group and 1:1 setting - all through the internet. Participants meet together through a virtual format once a week for a little over an hour to practice their signing and get feedback from deaf adults on how to improve their sign abilities. Topics of conversation are provided the week before, allowing you to practice your skills prior to meeting with the group. The Signing Room is a future membership site for those wanting to increase their signing skills and advance to the next level of sign language proficiency. Research shows that the best way to build language is to participate in ongoing give-and-take dialog. This program will do that through deaf language models and other intermediate level peers wanting to increase their sign language abilities. Our first pilot was extremely well received and we are ready to pilot it once again with a larger group! A foundation in sign language. Best recommended for people who have the vocabulary usually taught in ASL 1 and ASL 2. A quiet and distraction free environment during the class. Contact Stefanie Kessen at TheOnlineItinerant@gmail.com for more information. Sponsored by The Online Itinerant, Gallaudet University: Regional Center Midwest, and John A. Logan College. WAD is offering ASL 1 (beginner) for adults only. This ASL class is taught by a Deaf teacher. You will also have the opportunity to learn a few things about Deaf Culture. This location is at the Elisha D. Smith Public Library in the Activity Room. 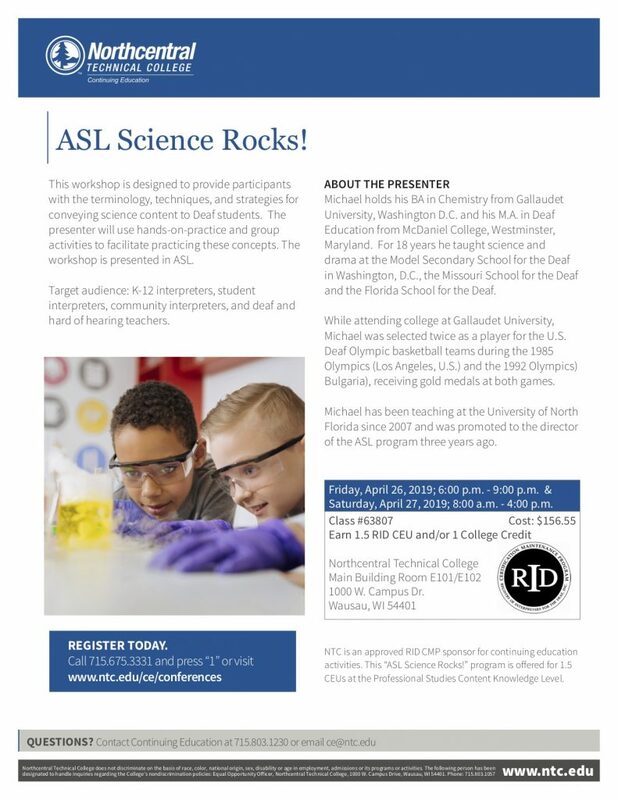 Email asl@wisdeaf.org if you have any questions. Educational Interpreter Workshop: "Taking Your Work from Good to Great: Strategies for Interpreting in K-12 Educational Settings"
Workshop from 9:00 a.m. - 3:00 p.m.
Refreshments provided, lunch on your own. Interpreting in K-12 educational settings is challenging and highly complex work, which is often done in isolation, or without much support. If you are looking for ways to take the good interpreting work that you are doing in classrooms and make it great, you won't want to miss this workshop! During this interactive workshop, we will explore the complexity of interpreting in education and discover strategies that will take your interpreting to the next level. The day will be reflective, active, and fun- so come prepared to give your brain and interpreting skills a workout! interpreting from the University of Wisconsin-Milwaukee (UWM) in 2004. Along with interpreting, Jen is an instructor at UWM within the interpreting program, and has experience as a presenter, mentor, and academic advisor. Check out the booth provided by Outreach and look at the latest news on License and EIPA test as well as the services they have to offer. WisRID is an approved RIDCMP sponsor for continued education activities. This program is offered for 0.5 PS CEU's at the same content knowledge level. ASL Story & Activity: "Rabbits & Raindrops"
We are offering ASL stories and activities to all children and parents. The story will be signed by a Deaf individual and activities will follow. Snacks will be offered by Outreach/SLAD, and drinks will be sold in the clubhouse. March 2: "Don't Let the Pigeon Drive The Bus"
April 6: "Rabbits & Raindrops"
May 4: "Red: A Crayon's Story"
July 6: "Giraffes Can't Dance"
Co-sponsored by Southern Lakes Association of the Deaf. Outreach staff have been collecting prom dresses, suits & tuxedos, shoes, and purses for WESP-DHH Quest/Prom. Come to Kastner Hall to try on and take home your prom attire. NO COST TO YOU! For all families that have a child currently registered with WDBTAP. 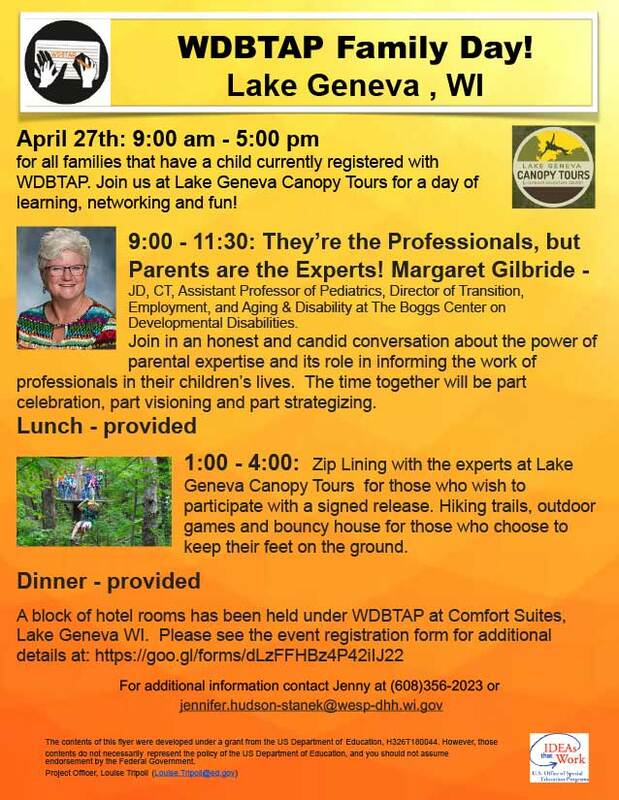 Join us at Lake Geneva Canopy Tours for a day of learning, networking and fun! Employment, and Aging & Disability at The Boggs Center on Developmental Disabilities. Join in an honest and candid conversation about the power of parental expertise and its role in informing the work of professionals in their children’s lives. The time together will be part celebration, part visioning and part strategizing. For those who wish to participate with a signed release. Hiking trails, outdoor games and bouncy house for those who choose to keep their feet on the ground.